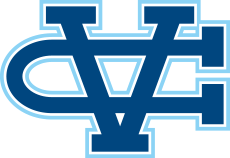 Los Gatos, CA - The Valley Christian Warriors faced off against 61 other schools from around Northern California at the K-Bell Invitational, Saturday. For the second time in as many weeks the weather brought showers, wind and cold but the Warriors battled through posting some impressive marks on the day. The throws crew was stellar once again placing multiple athletes on the podium. Max Moore won the varsity boys discus for the second consecutive week. It was a big personal best for the junior, his throw of 152-7 is a 12+ foot improvement from the previous week and moves him to #2 all-time in school history. 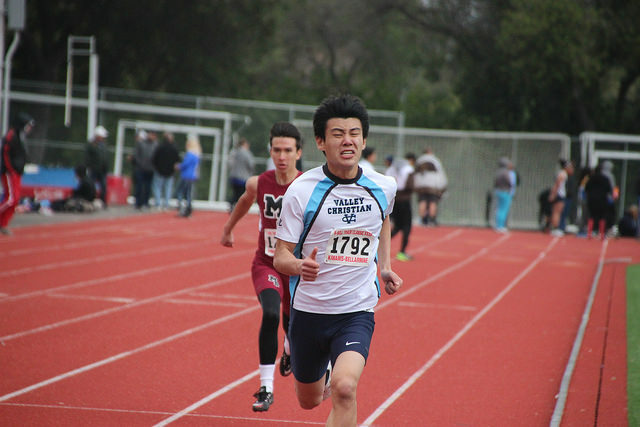 Moore has improved over 20 feet from the end of last season and is currently ranked #1 in WCAL and #2 in CCS. He also threw a personal best 39-4 in the shot put. Daniel Machado won the frosh-soph shot put for the third consecutive week. His throw of 47-0.5 was nearly a 2 foot personal best! Machado followed up his breakthrough performance in shot put with a 2nd place finish in the Frosh-Soph Discus with a throw of 114-1. Other outstanding finishes in the shot put came from Athyia Iese and Dylan McCreery. Iese finished second in shot put with a mark of 39-1.5 and is her second consecutive week throwing over 39'. She also finished 6th in the discus with a season best 99-2. Dylan McCreery finished 5th in varsity boys shot put with a personal best throw of 45-9. Anna Maumalanga broke 100 feet in the discus for the fist time ever to finish 4th in the varsity girls. She also finished 13th in the shot put with a season best 29-1. Elizabeth He had a breakthrough day improving over 3 feet in the shot put and more than 20 feet in the discus! Her marks of 27-4 in the shot put was good for a 15th finish, her discus throw of 78-0 finished 16th. It wasn't just the throws that were impressive. 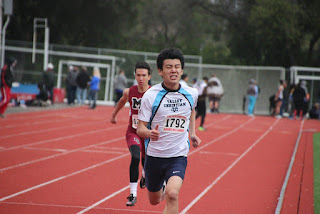 Charlie Bostic won the Frosh-Soph 100 meters by more than 3 tenths of a second, running 11.64 into a headwind. Matt Weeks also finished 6th in the triple jump with a season best 41-0. Top finishes in the mile run came from Joe Renati (4:46) and Maggie Theaker (6:04). The Warriors open the WCAL season at home on Wednesday facing Serra and Notre Dame Belmont. Field events begin at 3 pm, running events 3:15 pm.